Nazeri Heart Center is a cutting-edge cardiology practice specializing in interventional procedures. Founded by renowned heart and vascular specialist Professor Iraj Nazeri, our practice offers advanced diagnostic and treatment methods to treat a comprehensive range of cardiovascular conditions, as well as prevention education and early intervention. Our dedication to quality care and Prof. Nazeri’s collaboration with other leading physicians draws patients from across the country to our heart center in Tehran, Iran. Professor Iraj Nazeri is an interventional cardiologist and professor of medicine at Tehran University of Medical Sciences in Tehran, Iran. He is a fellow of the American College of Cardiology (FACC) and an active member of the Iranian Heart Society and Texas Heart Cardiac Society. After graduating from high school in Kermanshah, Prof. Nazeri continued his education at Tehran University of Medical Science in Iran and completed his training in adult cardiovascular diseases in 1971. He was named outstanding fellow of the world-renowned cardiology program at Tehran University, led by Professor Rashid Massumi. Subsequently, he completed his fellowship in interventional cardiology in the United States at Texas Heart institute in Houston, Texas. In 1987, Prof. Nazeri performed the first coronary angioplasty in Iran, a procedure that opens the blocked artery with a tiny balloon. 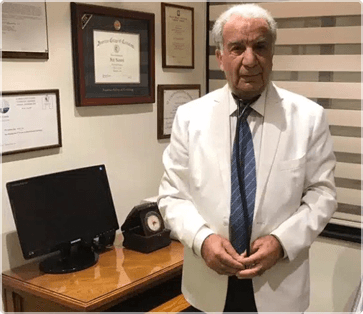 He has pioneered the field of interventional cardiology in the country, having established the first interventional cardiology training program in Iran at Tehran University of Medical Sciences. Prof. Nazeri has helped develop novel techniques for the treatment of congenital heart disease. In 1988, he performed Iran’s first percutaneous closure of patent ductus arteriosus (PDA), a remnant shunt between the aorta and a pulmonary vein. He also pioneered the percutaneous treatment for coarctation (congenital narrowing) of the aorta by performing the first procedure in 1989. Prof. Nazeri currently leads a team of cardiologists, interventional cardiologists, and cardiac surgeons who perform transcatheter aortic valve implantations in Iran. This cutting-edge treatment for patients suffering from severe narrowing of the aortic valve (aortic stenosis) uses a stented valve, which eliminates the need for higher risk open-heart surgery. After decades of dedication to teaching at the Tehran University of Medical Sciences, Prof. Nazeri remains committed to passing along his knowledge. He has witnessed hundreds of his students, residents, and fellows continue his legacy in Iran and across the globe. He has been known as, and awarded frequently as, the best teacher and educator in the country. Prof. Nazeri is actively involved in medical research in the field of cardiology. He is often invited as a guest speaker to major national and international cardiology conferences. His advanced cardiovascular research has been published in many highly respected peer-reviewed international journals. Prof. Nazeri has collaborated with many cardiovascular experts to advance the field of heart and vascular medicine. His research interests include the prevention, diagnosis and treatment of atherosclerosis, myocardial infarction, coronary artery disease, peripheral vascular disease, structural heart disease and valvular heart disease. Diagnostic Performance of 64-Channel Multi Computed Tomography in Assessment of Significant Coronary Artery Disease in Symptomatic Subjects, The American Journal of Cardiology, June 2007, Nazeri, I, Shabestari, AA, Abdi, S, et al. Assessment of Patients After Coronary Artery Bypass Grafting Using 64-Slice Computed Tomography, The American Journal of Cardiology, March 2009, Nazeri, I, Shahabi, P, Tehrai, M, et al. Successful Transcatheter Aortic Valve Implantation Through Ascending Aorta and Total Revascularization Using Edwards SAPIEN Transcatheter Heart Valve System, The Annals of Thoracic Surgery, December 2011, Nazeri, I, Mandegar, M, Abdi, S, et al. Trans Femoral Transcatheter Aortic valve Implantation in Presence of Mitral and Tricuspid Prostheses, JACC: Cardiovascular Interventions, October 2012, Nazeri, I, Abdi, S, Mandegar, MH, et al. How Should I Treat Acute Left Main Coronary Obstruction after Transapical Aortic Valve Implantation? Euro Intervention, October 2013, Nazeri, I, Abdi, S, Mandegar, MH, Roshanali, F.